Whoever wishes to learn by hearing a divine speech must be silent with great interior joy. A still heart is a loving heart, which listens with a kind of ardent fever and receives inwardly the sweet allurements of the holy words. Therefore, whoever goes out to gather divine speech ought to do so with wonder and great delight. Even those who suffer great pain or grief, as if in a kind of stupor, even these can be awakened to the melodious cadence of this speech. And those who already delight in the highest celestial forms of love will be strengthened all the more. This sermon speaks of the angels in common, because there is joy in all the saints. It speaks specifically of two of the most noble creatures who have always remained steadfast. I have been moved by my love for them to point out how sublime is the grandeur by which God, in the beginning, created them, granting them the image of divine beauty. God dignified them with every adornment, placing them above the firmament. God gave them knowledge of every science with which they might be servants and ministers of divine greatness. God gave wings to each, so that those messengers who carry extraordinary news of the most noble magnitude might fly quickly, crossing any barrier, reaching every height. For it is on account of their sublime beauty that they are the ministers of the Trinity. Whenever they unfurl their wings in flight and then gather them gracefully together again, they make their ministry a sweet song. Since they are spirits endowed with the power of the most high, they make a song that no other creature is able to sing. These are the angels who are marked in Heaven and placed in positions of great strength. They are positioned in orders, of which there are nine, and each order is named initially according to its own greatness. But all of the angels are also named among themselves, having each a personal, individual name of great beauty. The first angels of whom I will begin to speak are two who are familiar to me, who are no less than the others, and who have a name of supreme significance. All the others, which I have named elsewhere [in other sermons], show forth their splendor as well. I love all the angels of Heaven, but two are the most cherished darlings of my joy who give me comfort day and night and offer me their gifts from the bountiful wealth of their riches. My Lord assigned them to me as guardians so that they might protect me from all harm. They have attended perfectly to this divine injunction as they have placed me, as it were, within the protection of their strong fortress. On my right and my left hand both angels hold me close, so that I cannot fall except through my own foolishness. While I hold myself firmly to them, my enemies are unable to harm me. And by the grace of John the Evangelist I know the proper name to call both of them. One comes from that order of angels who are given to Christians as guardians in this life. And mine is not among the lesser angels. I know this for certain; I learned it through having heard their speech. Her appearance is of overwhelming beauty, like a precious stone or a pearl of great value. And I love her before all others that remain as her companions. She is called the angel Sapiel, a name that reason reveals as meaning divine wisdom. My heart fills with joy every time I hear the name. She has all the rich charms, all of which she bestows abundantly upon me. Indeed, having been present with me steadily from the moment I was born into this life, I know by her courtesy and courtly manners that she is full of piety. But because I have led a sinful life and troubled her, I accuse myself before her. Yet Sapiel is good. She has spared my sin and my foolishness. She has always been the most faithful advocate for my soul before Christ. And my heart finds great consolation when her love is tested within me, for her love is full of every virtue and through it divine wisdom is established. She is adorned from head to toe with precious stones, and her garment is of every color, for my angel has been blessed with great power. Christ himself has assigned her to me, and thus her companionship is mine in Heaven. The other angel is one of the Cherubim, who have six wings and who sit upon the highest throne, and whose power from the angelic order of the highest magnitude is exulted from all others. This angel remains in the imperial courts of the highest heaven, which divine love is inflamed is always burning within this angel, and since she herself is most beautiful, she remains near the Trinity and must herself burn hot with the fire of beauty. Worthy of the highest realms of Heaven, she has been admirably named. 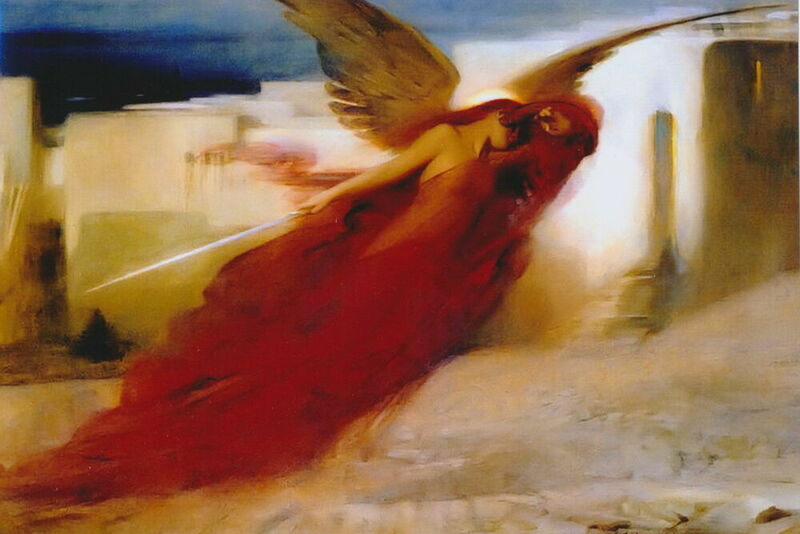 Christened from the mouth of John the Evangelist and with the great depth of his wisdom, she is the angel Emmanuel. And that name, which is the verbal expression of her greatness, thrives and grows as the evangelist knew it would. It would be easier to count the drops in the great breadth of the sea than it would to say or to think or to see the magnitude of her goodness. And that name, her verbal expression, does not begin to be the equal of her supernal magnitude. I cannot tell you of her fullness; my mouth makes only the sounds of a stuttering baby. This angel, who is full of every breadth and magnitude, was given to me by my Lord after my thirtieth year. It was at that time when I had entered into thoughts of more important matters since my flock was given into my care and I had neither the strength nor power of her might for that work. But the angel Emmanuel opened her wings and helped relieve me of the anxiety of this great labor, for she is in the glory of God and serves as interpreter of the dominion and power descending from the greatest heights. Emmanuel, being compassionate and devoted to God, consoled me, giving always to me abundantly of her many treasures. Clearly, among her treasures is the praise and glory represented by her blessed name, which is full of beauty of many kinds. Indeed, her power in Heaven is such that no likeness of its loftiness can be named. In fact, Emmanuel is baptized in that royal river that always flows forth from the throne of the most high, in which the exalted God, the Father, remains, and the son and the Spirit, who flames forth. The rivers, of which there are five, are greater than all seas – and over each river in its great magnitude, God, the most high, remains seated. The rivers, of which there are four major ones, all flow to the sea. In their union, what they were as many in multitude becomes one in magnitude. My Emmanuel was baptized in this multitude and magnitude, in this river flowing to the sea from the throne of the most high. I was one who came to visions early in life — preschool age, even. And there was a time that I thought I had walked away from them, but, no. In order to become sensitized to your gifts (which are there if they are urging you to use them), I highly recommend two things: (1) contemplative prayer (Christian quiet prayer); and (2) reverence (that is, sitting in a place where you can look upon Jesus and angels). I recommend contemplative prayer because the first skill that you want to strengthen is your own quieting down (remember, the language of God is silence), and listening. To learn to listen to silence takes time and patience. Reverence will give your heart some exercise by letting it express its love for God and his angels. But don’t get discouraged. The biggest problem I see with mystics is that they don’t understand themselves. They want or think that all mystical experiences will look like those that you read about: voices like Joan of Arc, or visions like Hildegard de Bingen. But those are people that I call, Heads, because they receive their visions through their thoughts. But there are people who feel their way through their experiences with God. I call these people, Hearts. And then there are those people (who I think have the worst time identifying themselves) who just know what the right thing is to do, get up and do it. Without thought, really, and even strong emotion. I call these people, Hands. Oh, and then read as much as you can. You might recognize in someone else’s description of their mystical experiences something that you recognize as having happened to you.